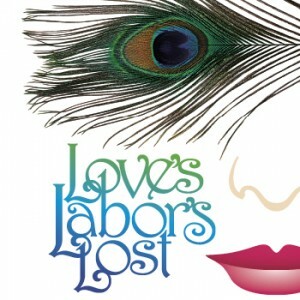 Love’s Labour’s Lost, next week! 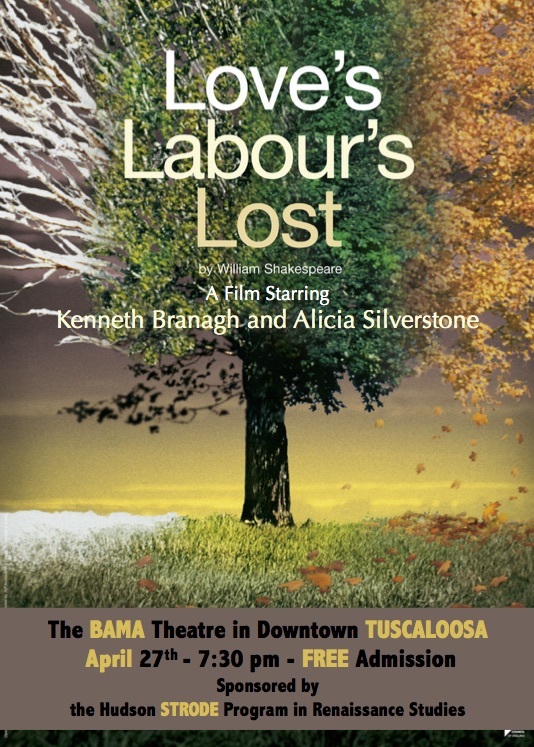 Back for its 14th season, Tuscaloosa’s The Rude Mechanicals will present Shakespeare’s comedy “Love’s Labour’s Lost,” 8 p.m. each night, June 1-4, in The Park at Manderson Landing; in case of rain, the show will move indoors to the Allen Bales Theatre, Rowand-Johnson Hall on the UA campus. Free admission. Live pre-show music begins at 7:30 p.m. Patrons should bring blankets, chairs or other seating material. For more, call 348-0343. The Hudson Strode Program in Renaissance Studies presents its final film of the 2014-15 Shakespeare Film Series, Kenneth Branagh’s 2000 Love’s Labour’s Lost. Free and open to the public. The King of Navarre and his three attendant lords make a pact to forswear women for three years so that they can steep themselves in academic pursuits. Almost immediately, the Princess of France arrives on a mission from her father, accompanied (of course) by three attendant ladies. We all know where this is going. Each man falls in love with a different woman but keeps his love a secret, until a scene when each man, thinking he’s alone, confesses his love by reading a sonnet out loud. Realizing what has happened, the men break their vows and agree to pursue their women, who do not allow themselves to be won so easily. Love’s Labour’s Lost contains many of the tropes of Shakespearean comedy: wooing lovers, mixed-up letters, bawdy puns, secondary characters who serve as foils and comic relief, and the promise of marriage. More than that, it is a play about language, containing more rhymed verses and new words than any other play in Shakespeare’s canon. It plays with poetic form and delights in linguistic excess while also mocking characters like the Spanish Don Armado, whose attempts at verbal brilliance fail miserably and hilariously. The play’s ending differs from other comedies by moving toward marriage but suspending it after news arrives that the King of France has died. The couples will separate for a year, as the women return to France and force the men to renew their vows of chastity. What happens next remains unknown: records survive of a Shakespeare play called Love’s Labour’s Won, but it has never been found. British actor-director Kenneth Branagh is generally credited with ushering in a new era of Shakespeare films in the 1990s. Beginning with 1989’s Henry V, Branagh envisioned himself as the Laurence Olivier of the modern era, but with a twist. Branagh became famous for his casting of both notable British stage and film actors (including himself, Emma Thomson, Adrian Lester, and Richard Briers) and Hollywood actors (including Robin Williams, Denzel Washington, Keanu Reeves, Alicia Silverstone, and Matthew Lillard), and his films strive to popularize Shakespeare’s plays for contemporary audiences. His Much Ado About Nothing (1993) earned critical and commercial success, while his “uncut” four-hour Hamlet (1996) was a star-studded tour de force. With Love’s Labour’s Lost, Branagh took a risk. How would he translate Shakespeare’s play about language and wordplay to the screen, when the play itself was rarely performed on stage before the mid-twentieth century and is one of Shakespeare’s least well known? The answer is a 1930s-era musical comedy that includes music by Irving Berlin, George Gershwin, and Cole Porter and showy song and dance numbers by its non-musical theater stars, with the exception of Nathan Lane, whose Costard reminds everyone that “There’s No Business Like Show Business.” Critics and audiences were generally unimpressed and the film failed at the box office, but there is much to delight in here. Sure, the film is cheesy and imperfect, the musical numbers aren’t perfectly polished, and only about a third of Shakespeare’s words survive, but the film’s use of song and dance and the sheer absurdity of many scenes remind us of the joy and wordplay highlighted by the play. Beneath the razzle-dazzle, Branagh keeps the dark undercurrent of Shakespeare’s play with newsreels of European conflict and an ending that reminds viewers that loss is a part of life and that love must sometimes wait. Improbable Fictions presents a staged reading of Shakespeare’s Love’s Labour’s Lost, Thursday March 10th, 7:30 pm, in Farrah Hall Room 214 on UA’s campus. Pre-show music begins at 7:00 pm. Free and open to the public. Program notes included below. Scott’s words here are a great overview of Improbable Fictions’ aesthetic. So consider what we have for you here tonight as a trip to the building site. It is a bit better than just looking at the blueprints, but it is not the finished building. A staged reading is a strange animal. It is a performance but not a complete one. You are visitors at what can only be described as an early rehearsal for the play. We will do our best to give you a sense of performance but our scripts are still in our hands…we’re still reading. I feel that this particular play, Love’s Labour’s Lost, is uniquely suited for this form. There are no big battle scenes; no sword fights. It is charming witty people saying charming witty things. I promise you will find something to amuse you. You will be entertained and you will have a better idea of what Shakespeare is like than reading it off a dry and dusty page. But it is not the last word; not the finished product. If you like our efforts, I implore you to seek out full productions. They can be found ranging from elaborately produced extravaganzas with sumptuous costumes and massive sets to bare bones efforts with a couple actors and a stool representing a castle. All are worthy of your attention. Only then can you see the full majesty of the Bard. The play IS the thing. Go and see as many as you can.